The attraction of culture, lifestyle and the beauty as poetry of Hue have made Mr. Jung Dong Ju from Seoul (South Korea) decide to stay with this land for a long time just after a tour. For nearly 10 years, the couple’s affection for Hue has become deeper and deeper. "I have been bound to Hue"
In the pretty cold weather, and in the house located at the end of the lane number 9 on Ngo Gia Tu Street (Hue City), Mr. and Mrs. Jung Dong Ju and two students were having fun chatting. If I didn't know them in advance, I would think they were a family. They invited us to try Korean cakes and enjoy hot tea. The conversation between us became more and more interesting according to every word of Mr. Jung about the fate of the two people from the land of kimchi with this land. In 2009, when he was at the age of 55, and the two-year term as a director of a Korean company’s brand in Ho Chi Minh City ended, he went to Hue to travel before coming back home. 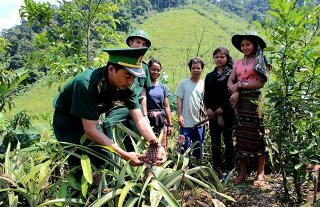 “Discovering the cultural depth, witnessing the harmonious lifestyle of the locals and the beautiful scenes as poetry made me, a person only knew how to do economy, feel peaceful and comfortable, a kind of feeling that is difficult to describe. That was how I have been bound to Hue,” Mr. Jung said. 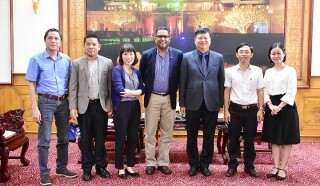 In a meeting with Korean friends teaching at the Faculty of Korean Language and Culture, Hue University College of Foreign Languages, he knew that the faculty was lacking lecturers; he did not hesitate to apply for the position. After six months of handing over the old work in his hometown, Mr. Jung came to Hue to make a long-term commitment to the land he has loved. "At first, my children did not agree because they were worried about the differences; however, when they visited Hue, they felt completely relieved," Mr. Jung said. As Mr. Jung used to be a manager, he knows what employers need from graduated students. Thus, in addition to the classroom materials, he also established a Korean language club for students to improve their knowledge. 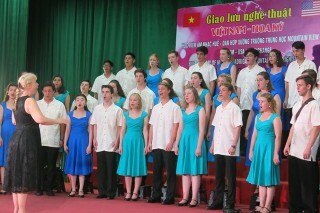 Since then, his house has become a place for the club’s activities. The students, Mr. and Mrs. Jung cook Korean dishes, learn Korean culture via stories, and traditional games, etc. Being close to students, he knows that many of them have to do part-time jobs to earn money for their studies; some of them do not have time to participate in the Korean language club activities as they are busy with the part-time jobs… this makes Mr. Jung's heart sobbed. “I was born in a family which was not very well-off. My student's years at Korea University were very hard, that’s why I feel sympathized with them,” Mr. Jung shared. Since then, their house has become a home for students with difficulties. “Being facilitated by them to live in their house, I was both happy and worried. At that time, my Korean was not much, I did not get used to the lifestyle. Thanks to their intimacy and kindness to teach me every small thing, I feel more confident and mature. I have been fluent in communicating in Korean, and know more about Korean culture. I love and respect them like my parents,” Vo Thi Van, a student, said. Such love is not enough, he still feels melancholy every time he joins the faculty in considering scholarships for students. "I find that many students deserve to receive the scholarships, but because of the limited funding, I cannot do anything," Mr. Jung said. The question of how to help the students follows him to his sleep every night. By sharing his concern with his children, friends and relatives in the homeland, followed by phone calls connecting with businesses in South Korea, the "Desire" scholarship fund was finally established two years after he became a lecturer. Since then, about 20 students of the Faculty of Korean Language and Culture have received "Desire" scholarships every year, each of which is enough for them to pay tuition for one semester. Many students, who had received scholarships, have now become fund sponsors. Mr. Jung is also a “bridge” to help many students have the opportunities to study, do PhD degree, and have part-time jobs in Korea, etc. 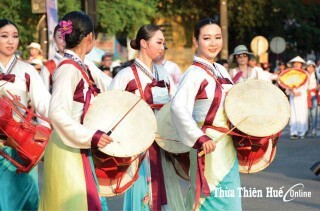 Like Vietnamese, Koreans greatly respect the traditional Lunar New Year holiday of the nation. This is the time when children and grandchildren gather together with their families. 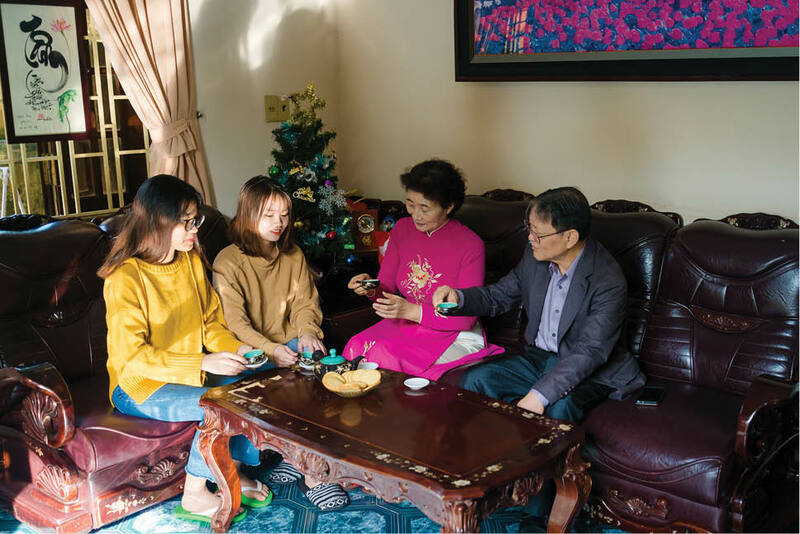 Nearly 10 years living in Hue, Mr. Jung and his wife shared their time equally, they in turn celebrate the Lunar New Year holidays one year in Vietnam, and one year in Korea. When they celebrate the holidays in Hue, the families of their two sons in Seoul go to Hue to spend time together with their parents. Mrs. Ohh Yun Sook, who is very similar to the traditional Hue woman, always cares about her husband and children. As she perceived the happiness of her husband when he talked about his new work, she voluntarily went to Hue with her husband without concerning about the difficulties and obstacles ahead. Thankfully, people and life here are friendly and simple that she integrates very quickly. She considers her husband’s colleagues and students as her relatives. Sometimes, she cooks and invites them to her house for meals. 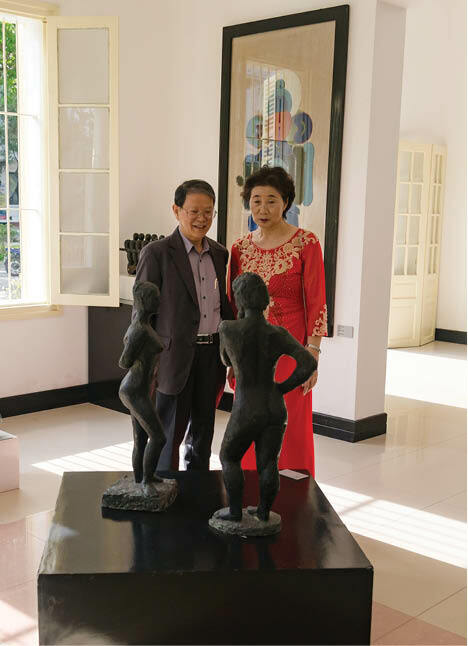 "Many of my relatives and friends travel to Hue because of their curiosity and excitement via my husband's stories," Mrs. Ohh Yun Sook, Mr. Jung’s wife, said. In their free time, the couple together stroll along the Huong River for sightseeing, or enjoy Hue cuisine, or visit the tombs, and learn about the Ancient capital’s culture… "For me, these are the beautiful years of my life", Mr. Jung said. The love that Mr. Jung gives to Hue is increasingly deep. 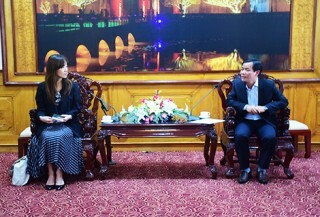 He is introducing the potential as well as the mechanisms and policies to attract investment of Thua Thien Hue provincial authorities to businesses and investors in Korea. When Korean businesses come to Hue, the development of the "Desire" scholarship fund is no longer a concern of this warm-hearted lecturer. And further planning is that graduated students also have more opportunities to find jobs in the future. With an open heart and special love for Hue, it is hoped that Mr. and Mrs. Jung Dong Ju will deeply attach to and do many meaningful activities for the peaceful land of Huong Ngu (the Huong river and Mt. Ngu Binh).